[T]he liquidity trap is real; conventional monetary policy, it turns out, can’t deal with really large negative shocks to demand. We can argue endlessly about whether unconventional monetary policy could do the trick, if only the Fed did it on a truly huge scale..
Krugman is right, this issue is contentious. It has been argued almost endlessly over the past five years. I submit, however, that over this time we have had several quasi-natural experiments on the effectiveness of monetary policy at the ZLB. These "experiments" along with an earlier one have shed some light on this issue. The first quasi-natural experiment has been happening over the course of this year. It is based on the observation that monetary policy is being tried to varying degrees among the three largest economies in the world. Specifically, monetary policy in Japan has been more aggressive than in the United States which, in turn, has had more aggressive monetary policy than the Eurozone.1 These economies also have short-term interest rates near zero percent. This makes for a great experiment on the efficacy of monetary policy at the ZLB. The outcome seems very clear: when really tried, monetary policy can be very effective at the ZLB. Now fiscal policy is at work too, but for this period the main policy change in Japan has been monetary policy. And according to the IMF Fiscal Monitor, the tightening of fiscal policy over 2013 has been sharper in the United States than in the Eurozone. Yichang Wang illustrates this latter point nicely in this figure. 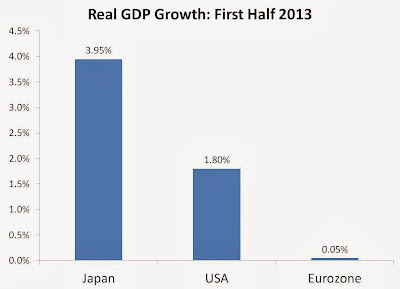 So that leaves the variation in real GDP growth being closely tied to the variation in monetary policy. Chalk one up for the efficacy of monetary policy at the ZLB. So what is the implication of this figure? 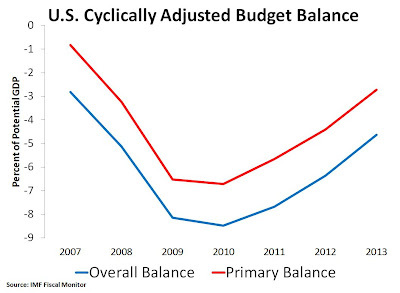 First, it shows that independent of business cycle influences fiscal policy has been tightening since 2010. 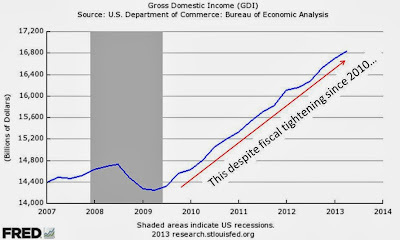 It has gone from an overall deficit of 8.5% in 2010 to an expected one of about 4.6% in 2013. Stated differently, the above reduction in the general budget deficit is not the government endogenously adjusting its balance sheet in response to improvements in the private sector's balance sheet. Rather, it is the consequence of explicit policy choices to sharply tighten fiscal policy. So what explains this development? How is it that fiscal policy tightening in conjunction with the Eurozone shocks, the China slowdown shocks, and other negative shocks has not slowed down aggregate demand growth? 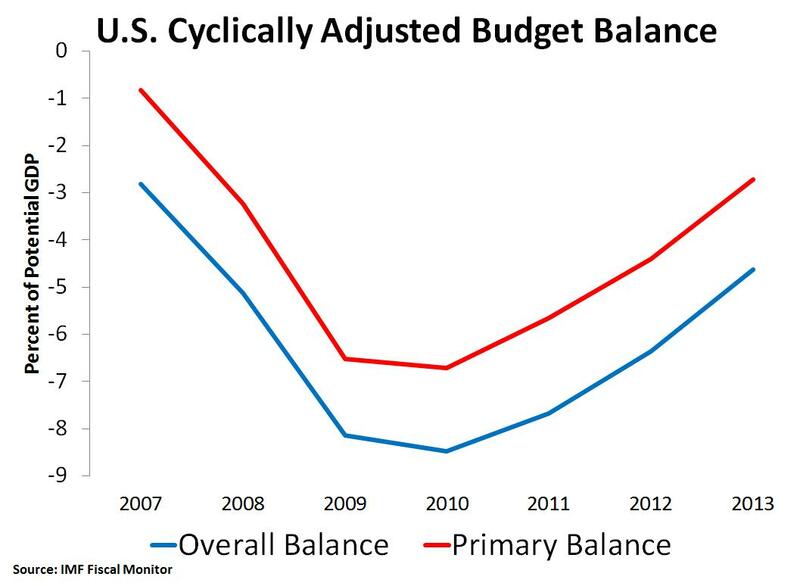 The answer is that Fed policy has effectively offset the effect of the fiscal austerity and the other shocks. This is another great quasi-natural experiment that demonstrates the effectiveness of monetary policy even with interest rates close to zero percent. Chalk another one up for the efficacy of monetary policy at the ZLB. Of course, this remarkable stabilization of U.S. aggregate demand growth by the Fed has been far from adequate in terms of restoring full employment. It is, therefore, ultimately frustrating to watch. For it speaks to both the power and shortcomings of current Fed policy. While these recent quasi-natural experiments on the efficacy of monetary policy at the ZLB are informative, an even more telling one can be found in the 1930s. This is the quasi-natural experiment of advanced economies going off the gold standard. As is well known, the interwar gold standard was flawed and played a key role in causing the Great Depression in the early 1930s. The countries involved were in a slump and their interest rates were near zero percent. Yet, as Eichengreen (1992) notes, the quicker a country abandoned the gold standard the quicker it experienced a robust recovery. This cross-country, quasi-natural experiment of the efficacy of monetary policy at the ZLB should give any monetary skeptic pause. Christina Romer notes that in the case of the U.S. economy this recovery was almost entirely the consequence of easing monetary conditions. 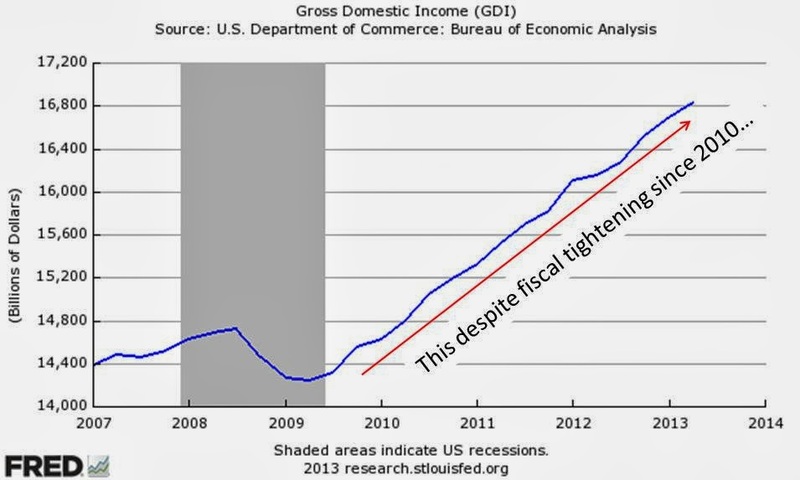 Fiscal policy played little role. 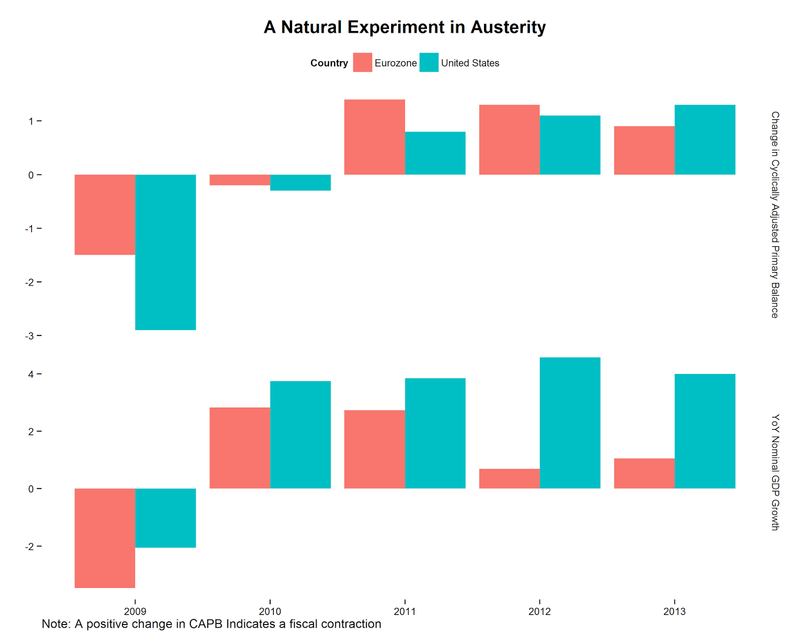 These three quasi-natural experiments indicate that there is much monetary policy can do at the ZLB. If so, the key issue is why central banks did not do more over the past three years to shore up the recovery. 1In more precise terms, the Bank of Japan has signaled more definitely than the Federal Reserve a permanently higher future monetary base level relative to the expected real demand for it. The Fed, in turn, has signaled the same relative to the ECB. David I had done a related post. Same conclusion! 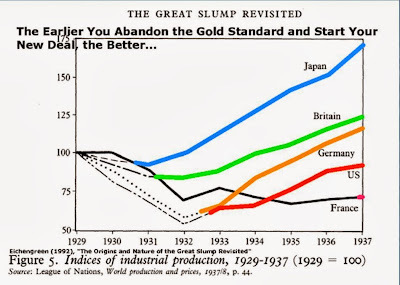 By the way, I think Spain is also a great example during the 30's that since they were never in the gold standard they did not go through a big slump. Also China did not go through a depression and they were under a silver standard. 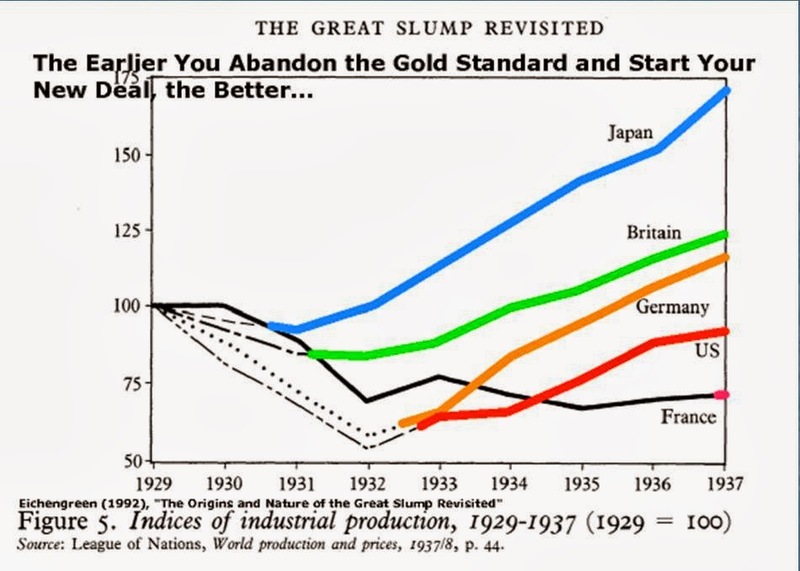 More evidence that the gold standard turned a recession into the Great Depression. on gold in 1929, Portugal did so in practice also in 1929 (although not officially until 1931), and Japan in December 1930. In the same month the Bank for International Settlements gave Spain a stabilization loan, but the operation was frustrated by a revolution in April 1931, carried out by republicans who, as one of the most attractive features of their program, opposed the foreign stabilization credits. Spain thus did not join the otherwise nearly universal membership of the gold standard club." However, Spain did duffer a severe recession with real GDP declining 5.8% from 1929 to 1931 according to Angus Maddison. Spain imposed foreign exchange controls in May 1931 (see Bernanke and James) and this seems to coincide with an economic recovery. Real GDP almost equaled its 1929 level by 1935, but then the Spanish Civil War started and real GDP fell to 28.9% below 1929 levels by 1938. It wasn't until 1951 that real GDP exceeded 1929 levels. So Spain suffered a depression, but it was war related, not gold standard related. P.S. According to the Angus Maddison dataset China appears to have suffered a one year only slump in 1934. I don't know the history behind that. Thanks Mark. I linked to your earlier comments in the post. A commenter at The Money Illusion implicitly raised the issue that Japanese RGDP growth rates are more volatile than the growth rates of the larger currency areas (which are also less open to extra-currency area trade) to which they are being compared. So I did a systematic analysis in to see how significant the first half of the year results were. The year 2000 is a reasonable starting point for all three currency areas since the eurozone only officially came into existence in 1999. (-0.45) and (+0.98) standard deviations away from their mean performances respectively. Another way of looking at this is to rank the semiannual averages of the quarterly real GDP growth rates. The US first half performance ranks 16th, the eurozone performance ranks 21st, and the Japanese performance ranks 4th out of 27 half-years. Further Ossification of the Zero Lower Bound?